The pilgrimage to Santiago de Compostela has many routes but the intrepid, multifaceted Danny Sheehy from Ballyferriter, County Kerry decided to go by sea in a niamhog from the Liffey, which he along with his fellow pilgrims, artist Liam Holden, musician Brendan Begley and stonemason Brendan Murphy had built. 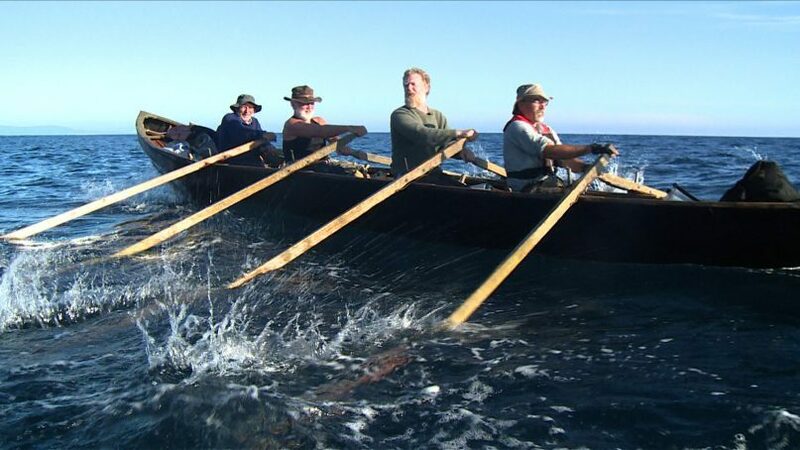 They rowed initially from Dublin to Rosslare and from there to an island off the Welsh coast. The following year they continued their journey across the English channel and in the third year they went on the final leg to Santiago. On the final part Glen Hansard, another musician, took the place of Murphy. The elements of the adventure which stand out are the frailty of the niamhog, the enormity of the sea and the single-mindedness of the adventurers as they set sail on a journey which was far from sane. But it was a journey that the early seafarers would have undertaken. It is that madness, call it what you will, which makes this documentary so compelling. It wrestles with a part of man’s instinctive need to live on the edge as exemplified so often by coastal communities who earn their livelihood from the sea and live by it. It is in these coastal communities that these pilgrim voyagers are greeted as if they were long lost friends. The cinematography captures the muscle strain of rowing such a small craft for such long periods, the creaking of the oars, the vastness of the sea, the enormity of large cargo ships and ferries and much else besides. But central to the entire tale is the singular desire of the men to reach Santiago and complete the unlikely task they had set themselves. The film is primarily in English but also has Irish (there are surtitles) quite prominently at the beginning. Given the course of the film, French and Spanish also happily intrude. It makes the entire journey have an appeal far greater than a mere four Irish men in a rowing boat. O’Ceilleachair captures the strengthening bonds of the rowers as their journey progresses and the importance of the sea to each of them, in particular Sheehy has an intense relationship with it. Hansard, when he arrives, adds a further element as he extols the importance of music in the adventure. There is a large and rich harvest of music which supports the entire telling of the story. What these men achieved together was unique. It is right that it is recorded for the generations which follow. O’Ceilleachair in a gentle and sensitive documentary celebrates this hard-earned, communal and seminal achievement.